Photos by Alan Weir (AW) and Brian Bain (BB). 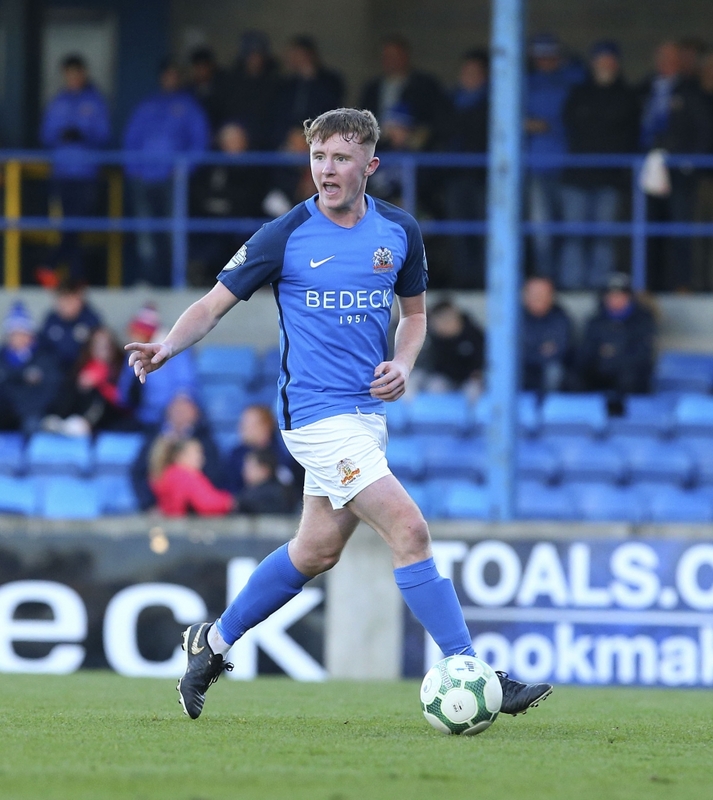 Glenavon defeated a stubborn Newry City side 2 – 0 at Mourneview Park in the late kick-off on Saturday to record their seventh consecutive league victory and move back to the top of the Danske Bank Premiership table. Andrew Hall broke the deadlock for the second game in a row when he converted a Jordan Jenkins cross at the second attempt on 79 minutes. Ben Doherty then sealed the points three minutes later by scoring directly from a corner-kick. The visitors ended the game with 10 men when Declan Carville was sent off for a second bookable offence in the 83rd minute. 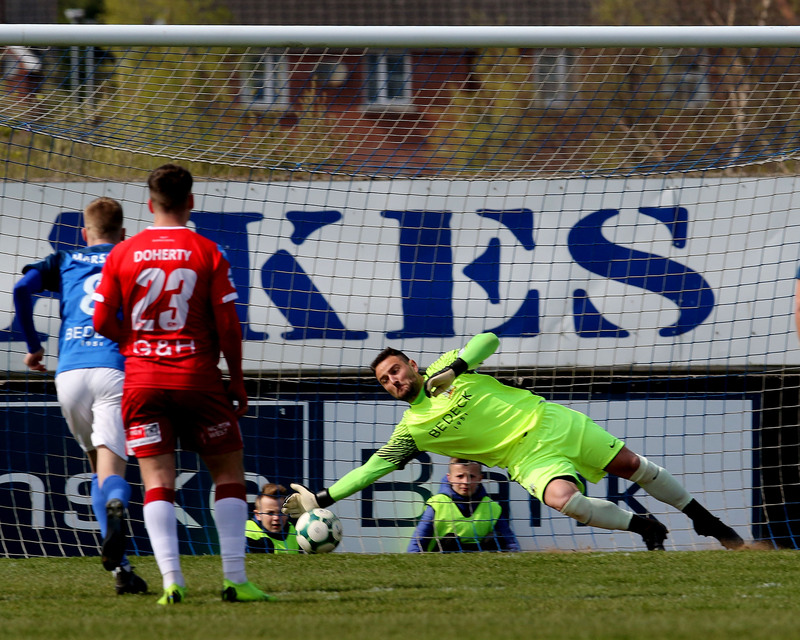 It took an excellent interception from Thomas McCann to deny Glenavon a goal in the sixth minute. Doherty won the ball in midfield and slipped it to Mark Sykes. The midfielder’s deflected shot looped up into the penalty area, and just when it looked like Stephen Donnelly was going to head the ball home, McCann nipped in front of the striker to head behind. Two minutes later Sykes picked out Stephen Murray with a cross from the left, but the striker’s header flashed across the face of goal. Donnelly and Doherty combined well down the left flank in the 10th minute to create a shooting chance for the former. His effort with the outside of his right boot went narrowly wide of the left-hand post. A quarter of an hour in, Mark McCabe headed over for the visitors after he’d been picked out by a James Walker corner. The Lurgan Blues struggled to find their rhythm in the first half, and they had a real let off on 27 minutes when Carville really should have opened the scoring for Newry. Goalkeeper Andy Coleman sent a long free-kick into opposite number Jonathan Tuffey’s penalty area. 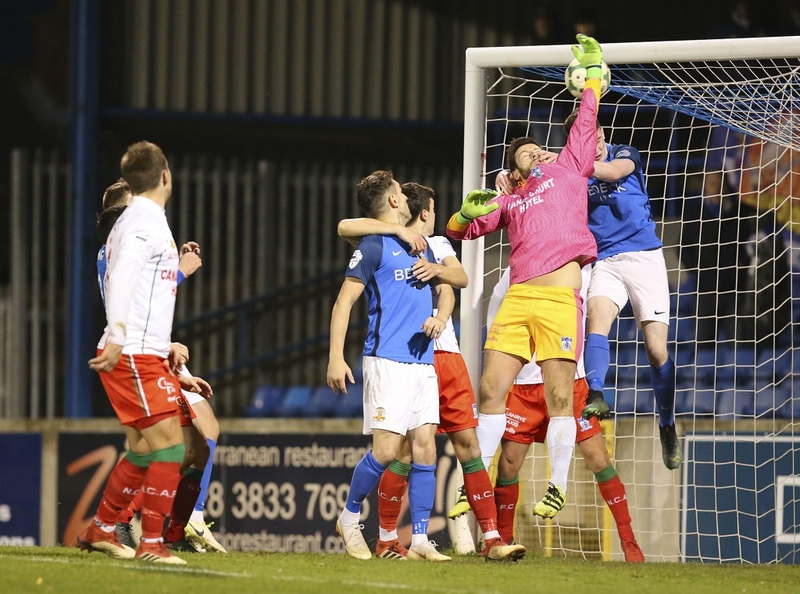 The Glenavon keeper came off his line and attempted to punch the ball clear, but under pressure from Stefan Lavery, he failed to make a clean connection. The ball fell to Carville and the midfielder attempted to side foot a shot into the far corner, only to see his effort slip wide of the post. At the other end a minute later Coleman raced out of his area to meet Murray. The striker managed to evade the goalkeeper’s challenge and send a cross into the penalty area but he couldn’t find a teammate. On 32 minutes McCann latched on to a headed clearance from James Singleton, controlling the ball before striking a shot on the volley, but his effort went harmlessly over the bar. 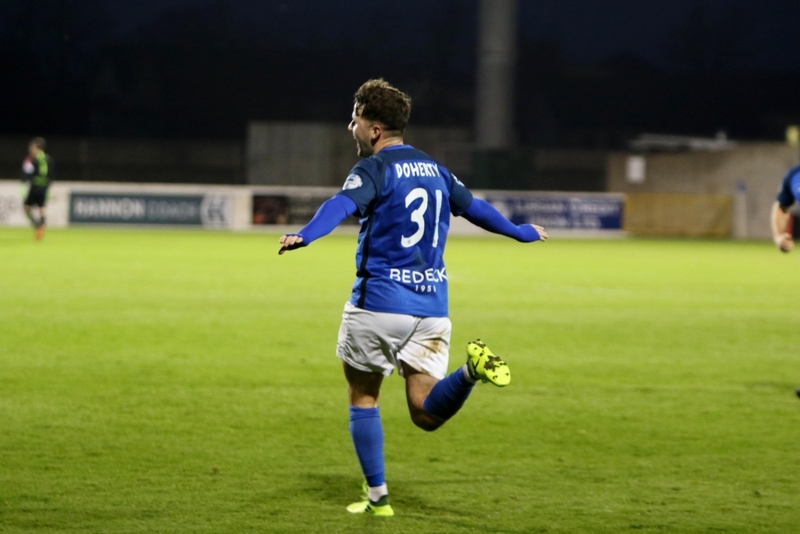 Caolan Marron turned in yet another Man of the Match performance at the heart of Glenavon’s back four, and the young defender had to make an excellent tackle to deny Stephen Teggart in the 33rd minute when the Newry player threatened to surge clear. 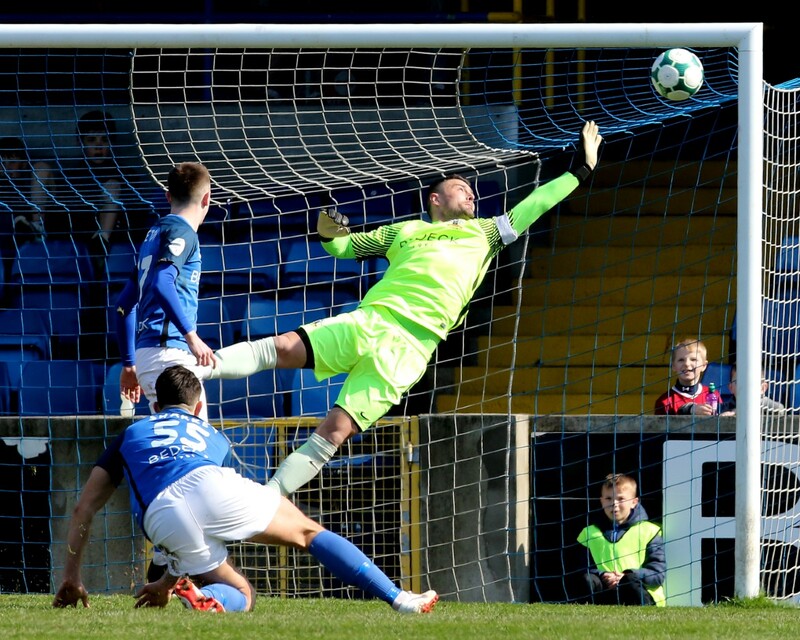 Glenavon’s top scorer Murray really should have found the net in the seventh minute of the second half when Sykes picked him out with a beautiful curling cross from the right flank, but he couldn’t direct his header past Coleman. Six minutes later McCabe turned well and fired a shot wide of Tuffey’s right-hand post at the other end. Josh Daniels was very unlucky not to score on the hour mark when he brilliantly controlled an excellent long diagonal ball from substitute Aaron Harmon before firing a shot in from a tight angle, with the ball striking the post. The rebound fell for Doherty and he struck a rasping shot from outside the box, but Coleman was equal to the effort. With the follow-up, Murray headed over. 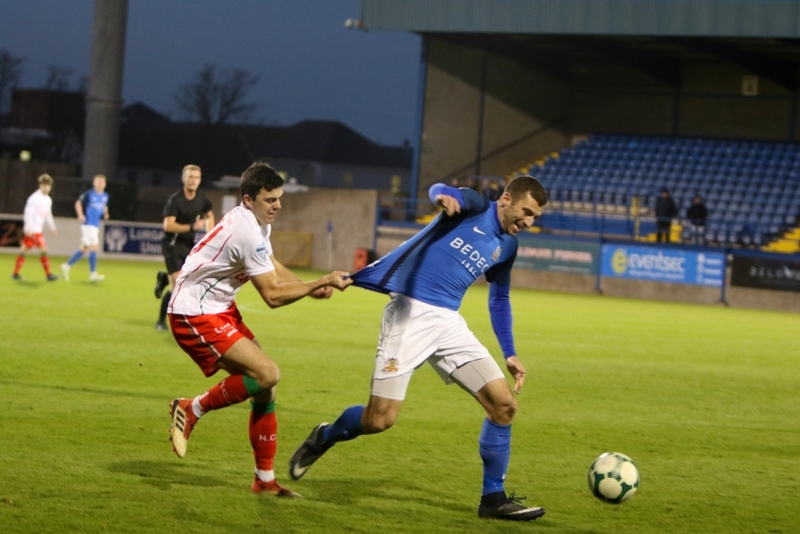 Dale Montgomery was booked for a cynical foul on Murray in the 69th minute when he pulled the shirt of the Glenavon striker after he had burst past him on the right flank. Four minutes later Teggart fired a shot into the side-netting from a narrow angle. 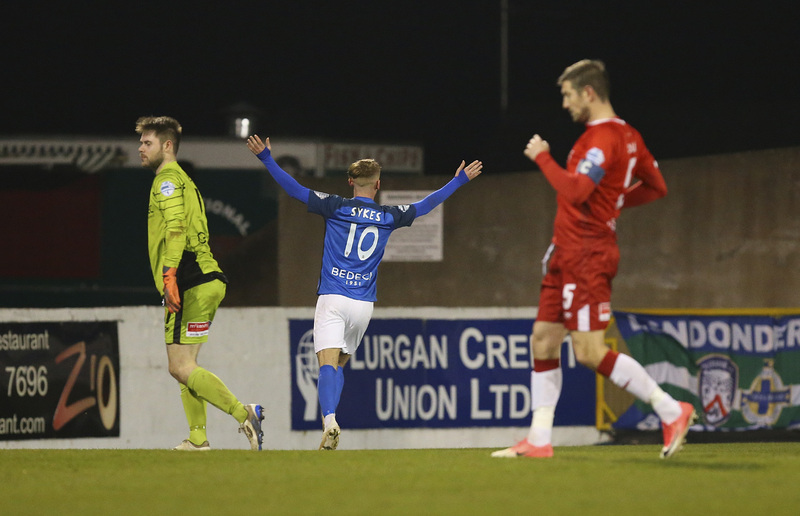 Sykes set off on one of his trademark surging runs from inside his own half in the 78th minute, carrying the ball deep into the Newry half, but he couldn’t keep his shot down. The deadlock was finally broken a minute later. Doherty slipped a ball into the penalty area for Jenkins and the young substitute found Hall with a low cross. 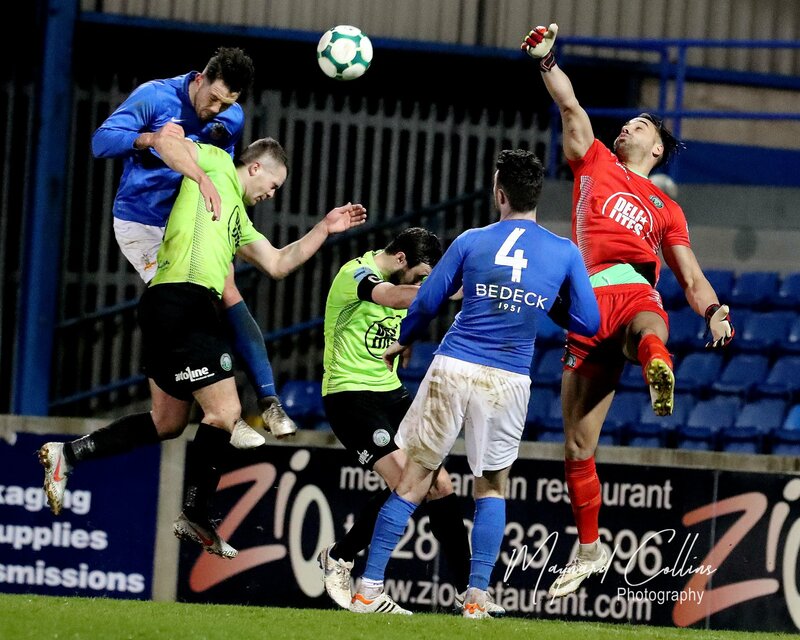 The winger’s initial shot was blocked by Newry captain Mark Hughes, but Hall made no mistake with the rebound, slotting a left-foot shot beyond Coleman to make it 1 – 0 to the home side. The three points were sealed three minutes later when Doherty swung in a corner from the right with his left foot which eluded everybody and nestled in the far corner. Carville was given his marching orders by referee Jamie Robinson in the 83rd minute when he was shown a second yellow card for a foul on Jenkins. The impressive Sykes almost added a third two minutes from time when he beat McCann with a deft feint before curling a sumptuous shot from 20 yards which struck the far post. 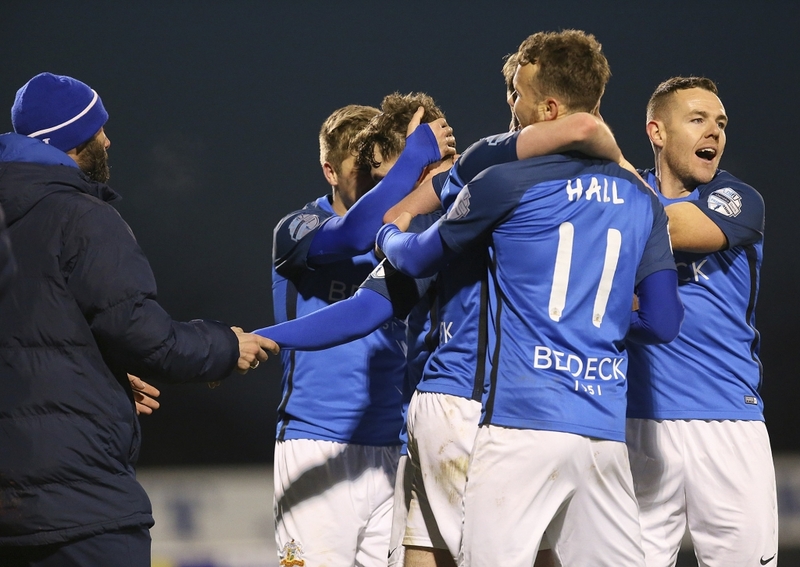 Mullen can feel hard done by for the second time following a match against Glenavon this season, as his side could quite easily have left Mourneview with all three points, just as they might have beaten the Lurgan Blues in Newry back in August. Gary Hamilton will be pleased by the resolve shown by his players. 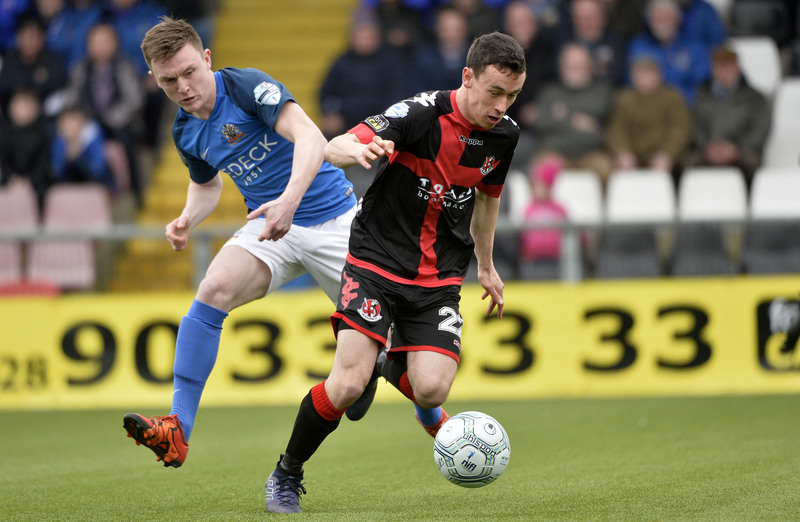 In the past two weeks they have proven that they can dig deep and win ugly when necessary, having previously demonstrated this season that they are capable of winning by producing scintillating performances, as they did against Crusaders and, particularly, Coleraine. Glenavon are in Mid Ulster Cup action on Tuesday night (October 30th) when they take on Loughgall in a quarter-final tie (kick-off 7.45pm). The Lurgan Blues then turn their attention back to the Premiership on Friday night (November 2nd) when they travel to the Showgrounds to take on Ballymena United (kick-off 7.45pm).